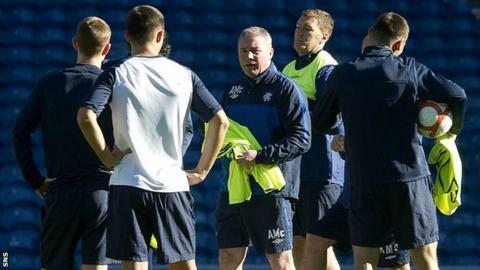 Rangers manager Ally McCoist says he does not expect special treatment from supporters because of his legendary status at the club. McCoist's side lie fourth in the Third Division, having drawn all three away games and were also knocked out of the Ramsden Cup in midweek. He says no warnings over his future have come from within the club. "I think I should be judged on the same basis as any other manager and obviously that's on results," he added. McCoist is the club's all-time leading goalscorer, making almost 600 appearances and winning 10 league titles. But he is not sure that means he will be cut any more slack if things continue to go poorly on the park. "I believe I'll get as hard a time as any manager will get if I don't get results," he stressed. "I don't think for a minute I'm not going to get any stick if we don't get results." In addition to his reputation as a player, McCoist's stance in the face of adversity at Ibrox in recent months endeared him further to the club's supporters. "Obviously fans will look at different scenarios within a manager's remit in the period he's at the club," he acknowledged. "That aside, I'm duty bound to the supporters and the club to get football results and get us out the division, and that's what I intend to do. If I don't do that I'll get as much stick as the next man. "Our target this season is to get promotion. If we don't do that there'll be a big disappointment - a massive problem." Much has been made of Rangers' Third Division opponents treating games against McCoist's men as a "cup final". And the former Scotland striker believes part of Rangers' problem is failing to do likewise. "We have to treat every game as a cup final. I'm not sure we're doing that just at the moment," he added. "That would be a major start, certainly in our away form in SFL 3, to help it." Meanwhile, David Templeton has had a scan on the ankle injury he sustained at Annan last week and McCoist hopes the winger's absence will be measured in weeks rather than months. Follow Alasdair Lamont on Twitter.